The phone that beats the image quality of both the Iphone 4S and the HTC One X combined; Nokia 808 Pure View is famous for the excellent camera and picture quality it offers. Capture your magical moments with the 41MP sensor which is added more beauty by the Carl Zeiss lens. Full HD videos and detailed 5MP images will be ready for instant sharing. A clever smart phone that has turned the world of digital photography upside down. When launched at the Mobile World Congress, the handset received a respectable position in the top 5 phones unveiled at the conference on 27th February 2012. The Nokia 808 is a strong built phone that is designed which features that will last long. 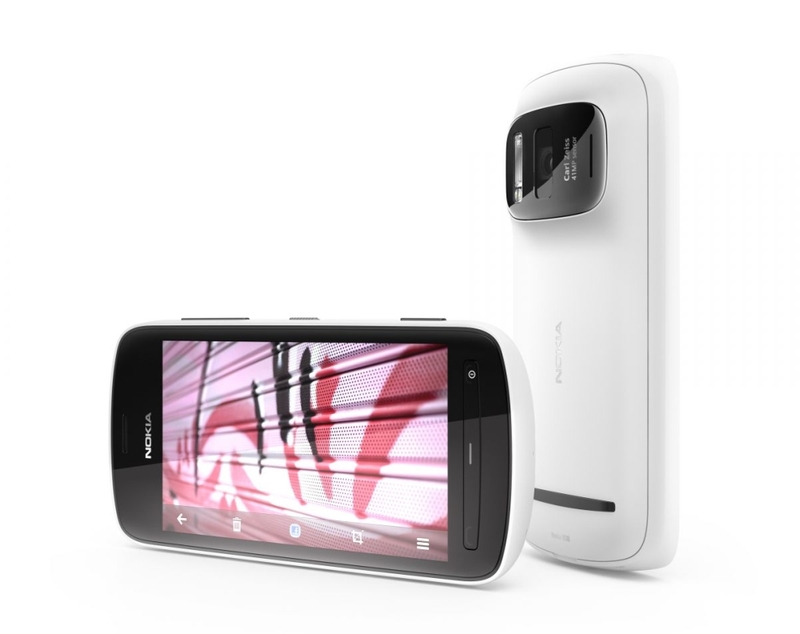 The device is an upgraded version of Nokia’s N8 which was a camera oriented phone as well. The robust built is nothing to be surprise about as Nokia continues to follow its tradition of designing sturdy mobile handsets and that’s exactly what a Nokia user relates to when making a purchase. A Gorilla glass display adds to the handset’s strength. With a 4 inch AMOLED display, and a resolution of 640×360 pixels, these figures appear to be slightly on the lower side since it would be great to enjoy the premium photo quality in a slightly increased screen size and better resolution. The device in integrated with a ClearBlack Display technology which makes it easier for users to look through their phone even in presence of direct sunlight. Measuring around 18mm the handset is thicker than the usual size of smart phones the cellular market is boasting about. However, the narrower design makes it suitable for one hand usage. For all your privacy issues, the 808 Pure View comes with a slider lock on the side and is also used to serve as a torchlight button when the slider is moved down. The 808 functions with the Nokia Belle Feature Pack 1 OS which can be upgraded to the Feature Pack 2 without much effort. In a generation of better and innovative apps, the apps available for this Nokia model are not many. Moreover the OS does not support Wi-Fi rather lets you share 3G wireless connectivity with an already installed app JoikuSpot. The device further offers a 16GB onboard storage that can be expanded up to 32 GB with a microSD card. For Skype lovers, the 808 comes with a front camera of 0.3 mp. Running on a 1.3 GHz processor is relatively responsive while the 512MB RAM makes the handset appropriate for multitasking. Nokia 808 Pure View is assembled with a 1400 mAh battery which when used moderately can last up to a full day. The Pure View as the name implies is what sets the phone different from other smart phones with good camera feature. The technology helps maintain details and keeps noise to its minimum even in low light conditions. One swipe zooming feature is useful and does not require two to three gestures for zooming in which many phones do. If you’re looking for a good quality camera oriented phone then Nokia 808 it is. Moreover, it will fulfill your basic needs of messaging and calling. Fore buyers who are looking for smart phones, then considering the high rates, there are other better phones available with upgraded OS and improved performance.